The Parent Teachers Association of Tufnell Park School. We’re looking forward to welcoming you to the first PTA meeting of the year, at a new venue, Bear + Wolf on Fortess Road. 8pm Wed 23rd Jan. The cafe will be closed, but there will be some refreshments. Come along and learn about our plans for 2019. A big thanks to everyone who supported last week’s Fundraising Friday for the girl’s football team. We raised £169.50! The PTA would like to extend a big thank you to all the parents, teachers and children who contributed to our Winter fundraising efforts this year. Despite not having the usual big Winter Wonderland, the Boogie Wonderland discos made a profit of £240, and the winter efforts in total (including calendars, raffle tickets and Christmas cards) look to have raised over £2500 for our school! The Christmas Jumper Day last Friday made £192.63 for the Save the Children charity. We still have a few charming School Calendars for sale. They are £5 each or 3 for £10. See Andrea at the School Reception. Happy Holidays from the PTA! Wear Something Christmassy tomorrow for Christmas Jumper Day, VOLUNTARY £1 donation, all proceeds will go to the “Save The Children” charity. We need more filled Jars for the Jolly Jar stall, & festive themed cakes / biscuits for the Winter fairlet after school tomorrow. 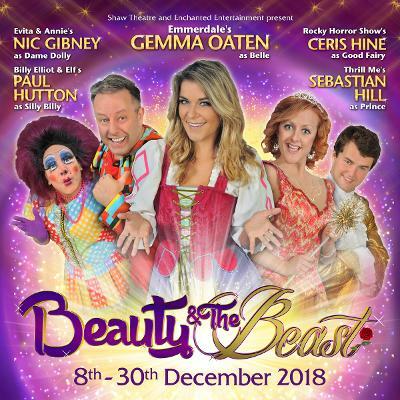 The Shaw Theatre in Camden have donated a family ticket (2 adults & 2 children) to see their panto ‘Beauty and the Beast’ at the 4:30pm showing on Sunday December 16th as a raffle prize. As we are not drawing the raffle until Monday 17th, we have decided to hold a silent auction – offering the tickets to the highest bidder. If you fancy a chance of winning this awesome prize, send us an email to tufnellparkpta@gmail.com with your bid, name and phone number – auction closes at midday on Monday 10th December! Boogie Wonderland next week – look out for those sign-in forms! Raffle tickets are out in school bags – make sure you get yours. Check out this year’s amazing prizes HERE! 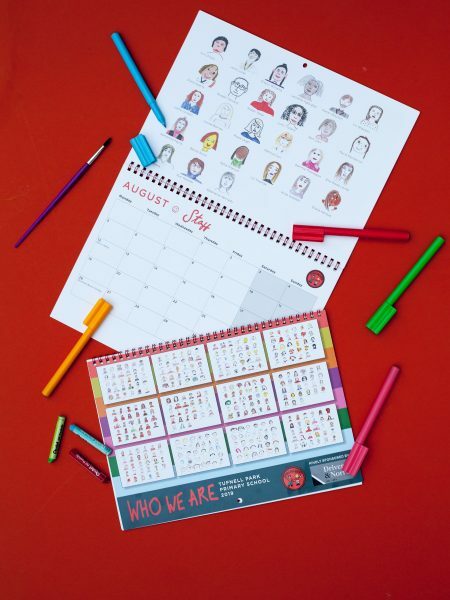 This year’s school calendar is a celebration of who we are. Children from every class and the teachers have drawn self-portraits which have been arranged by class. Equality is central to the school’s philosophy so we wanted to create a calendar that represented every child. The self-portraits create a record of who we are today and already the children who have seen the designs have loved guessing who’s who. One parent reported that it prompted her child to start reading spontaneously as she was so keen to work out who was who from her class. Local estate agent Drivers and Norris kindly pay for the calendars to be printed. This means that every single penny from their sale will go towards buying books for the new school library. You can buy calendars and pick up pre-orders from Andrea on reception while stocks last. Calendars are £5 each or 3 for £10, they make a wonderful Christmas present and memento of the school. Thank you to Daisy (Wren’s mum in Andromeda) for coordinating the calendars this year. Friday started off with children wearing spots for the BBC’s Children in Need appeal, we raised £220.64, a great result. Then on to the evening entertainment and Race Night, thanks to everyone who braved the drizzly autumn weather to support the event which made £740. Well done to Rachel Walters who won the best hat, and to the lovely Andrea for winning the cash prize. Wear Something Spotty this Friday for a suggested £1 donation. All money raised will go to the Children in Need Charity. A big thank you to everyone who supported the Fundraising Friday last week for Cygnus and Nursery. The sale raised £105.50 to be used for the early years classes. A reminder that the PTA will be holding an open meeting to discuss fundraising plans for the Winter. This Friday (9th Nov) after school in school, childcare will be provided. Come along and share ideas on supporting our school!